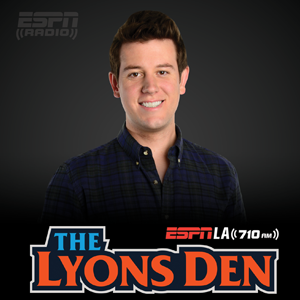 The Lyons Den is a weekly podcast hosted by ESPNLA's Ben Lyons that features exclusive interviews with the biggest names in pop culture and sports. Actor & Vancouver Canucks fan Ryan Reynolds calls in to discuss his new films SELF LESS and MISSISSIPPI GRIND plus ESPN's own Cari Champion hangs in studio to defend the offseason moves made by her LA LAKERS. Danny Abeckaser aka "Danny A." stopped by The Lyons Den to talk about his new film CLUB LIFE, his career working in the nightlife industry, and what Madison Square Garden was like when the Knicks were actually good. This week from the new documentary, 'Bernice' famed art dealer & champion of creativity Bernice Steinbaum talks about her life & career, and meeting Knicks legend Bill Bradley. Also, Clark Gregg from 'Marvel: Agents of Shield' stops by ESPN LA 710 and makes his 'Avengers of the NBA' list with Mychal Thompson. ESPN's Cassidy Hubbarth calls in to talk NBA Playoffs, how she got her start in the business, and who has made her star struck in the hallways of ESPN. Also, the host of ESPNLA's Morning Show, Kelvin Washington stops by to talk about his new gig. 'CSI: Cyber' star Shad Moss aka 'Bow Wow' explains how he scored his ticket for Mayweather vs. Pacquiao, plus Adam Richman calls in from London to talk about his new show, 'Man Finds Food', and his love of soccer. Adam Carolla has a funny new movie out called 'Road Hard', so he came on this week's episode to talk about it, plus Saffron Burrows from the new show 'Mozart In The Jungle' hangs in The Lyons Den and tells random LL Cool J stories. 'CSI: Cyber' star & starting QB for West Canaan James Van Der Beek shares stories from 'Varsity Blues' and explains his love of the Packers, plus comedian Wayne Federman stops by to talk about his annual Film Festival & his book about the great Pistol Pete Maravich. Sports Illustrated Swimsuit Model & single digit handicap Kelly Rohrbach stopped by to talk modeling, golf, and Instagram etiquette plus filmmaker Gotham Chopra about his new Kobe Bryant documentary, 'Muse'. Michael Mando from AMC's new show BETTER CALL SAUL talks hockey and ESPN's Ryan Ruocco shares Hubie Brown life wisdoms. Super Bowl champ & romantic comedy fan Shane Vereen shares stories from the big game and some movie picks, plus die hard Lakers fan Dominik Garci­a-Lorido talks about her new movie, WILD CARD. Ben discusses the 17 movies he saw at Sundance this year, including UNEXPECTED & DIGGING FOR FIRES produced by Chris Webber, and DOPE starring Chanel Iman, who both hung out in THE LYONS DEN. Ben welcomes Director & Knicks fan Spike Lee into THE LYONS DEN to talk about the state of their favorite team, his new movie DA SWEET BLOOD OF JESUS, and a possible HE GOT GAME sequel. Action packed edition of the Lyons Den as Manny Pacquiao & director Ryan Moore stop by to clown Ben on his Knicks and talk about their new doc, 'Manny'. Actor Matt Jones from the show 'Mom' shares his love of the Dodgers & former Dallas Cowboy Crawford Ker discussed his career post football as a successful restaurateur. In this year end edition of the Lyons Den, Ben counts down his Top 10 movies of 2014 with the help of his friend, Josh Horowitz of MTV News. In this episode of The Lyons Den, Ben catches up with actor & friend of Marcellus Wiley, Omar Dorsey, of Showtimes' 'Ray Donovan' and the star of the Iranian vampire movie, 'A Girl Walks Home Alone at Night', Sheila Vand. Star of THE LEAGUE and die hard Yankees fan Stephan Rannazzisi stops by to talk about his life post Derek Jeter, and the director of the Sundance doc, HAPPY VALLEY, Amir Bar-Lev shares stories about working closely with the Paterno family. MMA Legend Tito Ortiz stopped by the Lyons Den before his big fight vs. Stephan Bonnar to talk some trash, share some work out secrets, and discuss life after fighting. In the heart of the NFL season, Ben catches up with Colts Punter Pat McAfee & former Tennessee Titan Keith Bullock to talk pigskin, heckling, and Hip Hop. United States Soccer Hall of Famer & ESPN Commentator Julie Foudy stops by the 'Lyons Den' to talk about what would happen if her 1999 National Team played today's squad, as well as the current challenges facing her beloved L.A. Lakers. Actor, rapper, author, & former Chicago Bulls ball boy Common stops by the Lyons Den to talk about his love of the NBA and who the five best players are in Hollywood. Everybody Up! ESPN LA's Ben Lyons went around the NBA and previewed the upcoming season with the help of some familiar names like actor Anthony Mackie, ESPN New York's Alan Hahn, Grantland's Rembert Browne, Sacramento Kings big man Ryan Hollins, and Ben's cousin from Ohio Michael Burin. 'Brooklyn Nine Nine' star Stephanie Beatriz hangs in this episode of The Lyons Den as the Texas native shares stories and songs from her high school cheerleading days, talks about her new movie 'You're Not You', and invites a big (but kind of random) star to do a guest spot on her show. "Star of ABC's 'Scandal' and NBA fan Darby Stanchfield stops by to talk about one of Ben's favorite shows (hers), what it was like to meet Kobe Bryant and Kevin Durant, and Amar'e Stoudemire's recent red wine bath." Ben catches up with 'Fort Bliss' star Michelle Monaghan to discuss her latest project, being on 'True Detective', working with Tom Cruise, and her love of Big 10 football. Hang 10 brah! Director of the new surfing documentary, 'Strange Rumblings in Shangri-LA' Joe Guglielmino, and pro surfer Dion Aguis stop by the den to talk big waves, the great Sal Masekela, and living that "Haansel life".